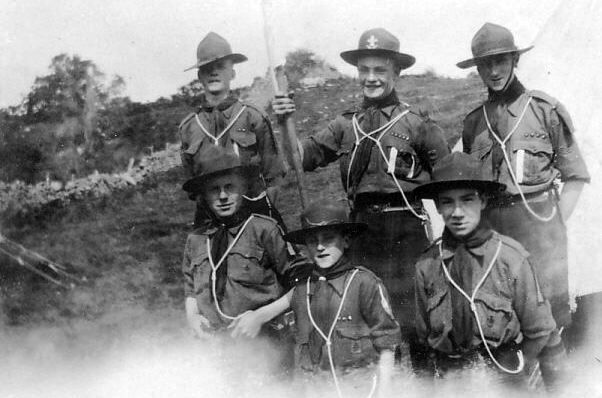 Monochrome photograph of a scout patrol. Patrol leader centre rear with two white stripes on pocket, Patrol Second rear right with one white stripe on pocket with four other members of the patrol. Probably taken at a scout camp during the years 1928-1934 at Dunrobin Camp Golspie in July 1929, Overskibo, Beauly, or Dunrobin Park. From a set of photographs glued to 10 sheets of brown paper with some spaces where photos have been torn out.